Two and a half years ago, we at Quince Orchard Dental Care were most fortunate to have Dr. Jay Plesset, an experienced general dentist and Washingtonian, join our team. Upon graduating from the University of Maryland School of Dentistry in 1977, Dr. Plesset spent two years as a U.S Navy Dentist stationed in Camp LeJeune, North Carolina. Thirty plus years later, Dr. Plesset has been a solo practitioner, part of our exciting group practice and also spent some time teaching at the Georgetown University Dental School. But who really is Dr. Plesset? Who is this friendly neighborhood dentist that just as easily captures the hearts of his patients as he rids them of their cavities? When asked about this, he asserted that his achievements, his maturation along life’s journey, his sociable nature, and his ability to bring kindness to the table in both personal and work life, defines who he is. In fact, he chose to become a part of the Quince Orchard Dental Care group practice because our practice embodies the same values and attributes that he upholds. Also, foremost in the decision was also his excellent relationship with Dr. Rouhanian and his appreciation for the implementation of world-class service and state of the art technology in the Quince Orchard Dental Care practice. 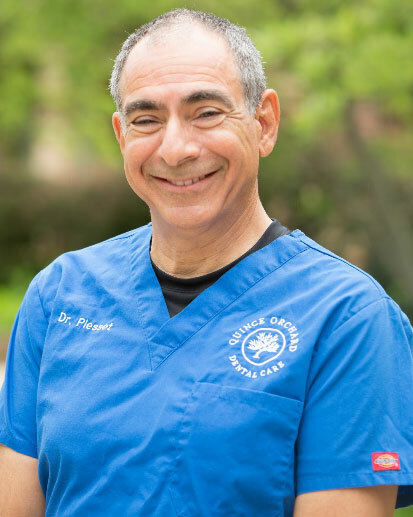 Dr. Plesset credits his decision to become a dentist, in large part as a result of his childhood Orthodontist, whose pleasant demeanor inspires him to this day. Always willing to learn, Dr. Plesset keeps himself abreast with the improvements and advancements within his industry by attending continuing education classes as well as being an avid reader of industry publications. On a personal note, Dr. Plesset recently celebrated 45 years of marriage to his wife Sue. Together they have two gorgeous daughters, Robin and Michelle and four wonderful grandchildren, Wriley, Ariella, Jordan and Kai. Fondly nicknamed “Dr. Poopie” by his youngest grandson Kai, Dr. Plesset enjoys spoiling his family as much as he takes pleasure in indulging in his many hobbies that include flying planes and playing classical piano. Now that you’ve become acquainted with Dr. Plesset, next time you’re visiting us at Quince Orchard Dental Care, be sure to say hello to him. Our staff, as well as our patients, have nothing but respect and love for him and we feel truly blessed that he decided to join our practice.